This is nylon Keycappie, taking siesta on a shift. Keycappie - Siesta / Keychain Ver. Cute tiny keychain accessory. You can set Cherry MX compatible key switch on his head. 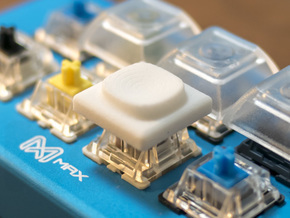 Give him a new life through setting your favorite key switch and keycap. 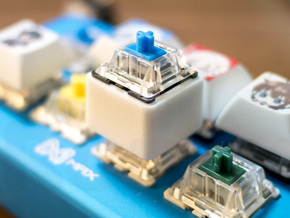 There are "Sitting" Keycappie already, but this time they come with "Siesta". Relaxing, they're taking a nap. Stop typing a work. Enjoy siesta with Keycappie. * Keyswitch, keycap and strap are not included. Tested only nylon (Versatile Plastic) material. You kindly welcome him on your keyboard as a keycap? Keycap version of him also available!